M.S. Exercise Science. ; B.S. Kinesiology. Registered Yoga Teacher ERYTA. 200 hours with kripalu and over 300 with other traditions. Intensive studies with Nora St. John, Marie Jose Blum, Jillian Hessel, Doug Keller & David Swenson. While fighting tick disease, the demands Erin could put on her body changed. 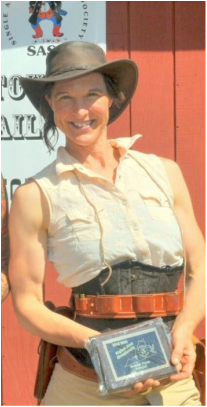 Although she still bikes and does various other outdoor activities, she has pursued her interest in firearms and found Single Action Shooting Society (SASS). She participates in numerous IDPA, USPSA, & Cowboy Action Shooting Competitions and is an NRA pistol instructor. ​She was top Virginia Shooter Cowgirl in 2017. In International Defensive Pistol Association (IDPA) competitions she focuses on using a firearm in real life self defense scenarios. ​Erin acknowledges the role her pilates practice has had in providing her with the flexibility, core strength, and balance she needs to effectively engage competition targets. with her love of competitive shooting. The first time I heard of pilates I was working as an Exercise Supervisor at the Greenbrier Resort in WV. I read about this alignment-oriented exercise called Pilates that I didn't even know how to pronounce correctly. I had a good feeling to learn more. Since I'd recently completed a Master's Degree program where I worked as a Graduate Teaching assistant, taught classes at the gym & senior center, & cleaned houses to pay for schooling, I barely had any funds to spend on anything outside of the basics. Still, I booked a flight to CA (back then it was CA or NY) to train with 2nd generation Master Jillian Hessel and started my pilates journey in 1997, and the journey to follow my gut. People around me thought I was crazy and cautioned me that I was wasting time and money to follow a fad, a little known exercise trend. I loved it and slowly continued my education of pilates and yoga training mixed with biking cross-country a couple of times and backpacking in the mountains out West. I immediately felt the benefits of the postural exercises to complement the long hours bent over my handlebars during long bike rides. Later the equipment training became available in Virginia and I traveled to Charlottesville for a year to complete the comprehensive training. As I practiced pilates and yoga, I noticed my normally bulky build, (a stocky 160lbs on a 5' 7" frame) transformed to a leaner, more graceful flowing body. My tight hips and inner knee discomfort that wouldn't allow me to squat in my early twenties went away and I can still squat effortlessly although in my forties now. Happy to spread the love of pilates and yoga, I worked with a few clients in my small home studio and traveled to people's homes and businesses all over Roanoke for years. I began noticing how clients enjoyed the passive stretching and relief of muscular tension, and added the Thai Yoga Therapy to better serve. I later became a Master Instructor to certify and instruct more authentic pilates teachers in the Blue Ridge Mountains. While racing competitively, I contracted what I thought was the Flu for the first time in my life, and it resulted in an idiopathic asthma for a year. Nine years later, when I was bitten by a tick again, I learned that my old symptoms were actually Babesia, a tick disease that causes air hunger, and borrelia. Where I used to be able to climb a long mountain at a mid-180's bpm heart rate on a weekly basis, I found myself wheezing & struggling to breath just going up stairs. I used the pilates and yoga breath to calm my mind during those scary episodes of not being able to breath and to send the breath to the lower part of my diaphragm rather than the short and shallow, higher chest breaths that only seemed to exacerbate my restricted breathing. While trying to remedy my new lung situation, my pulmonary doctor discovered on X-Ray that my upper spine curved excessively inward thereby reducing my lung capacity 15-25%, just by my inherent structure. He said that whatever I'd been doing (yoga & pilates breathing exercises and bike training) had helped me max out every other physiological function since I should have never been strong. From tick bites, I contracted Ly﻿me (Borrelia) d﻿isease and the co-infections Babesia, Bartonella, and Ehrlichia, and lyme meningitis. Acutely, I had a fever of 104.2 and a white cell count of 3, swollen lymph nodes the size of grapes, swollen spleen and liver. I was on medication within 10 hours of the onset of symptoms. The tick most likely was attached less than 8 hours since I did not see it before bed and found it when I woke the next morning. If you're reading this, there is HOPE. For more information on Tick Diseases or to read about scheduling a consultation with Erin to discuss tick disease, please click HERE.